I see a convergence of sales and marketing via content to reach buyers. In my research of successful companies, marketing is using content to reach many people at once (targeted to buyer personas) while great salespeople use the very same content to reach one buyer at a time. The best salespeople and sales organizations are providing just the right content - videos, text-based information via blogs and websites, real-time social networking feeds, images, infographics and the like - to educate, inform, answer questions and to move people through the buying process. There’s no need for hard selling in a world where curated content helps to move a deal towards close. The right content at the right time makes things happen. Every salesperson has the power to elevate their reputation to a position of importance. In the e-marketplace of ideas, successful salespeople educate and inform instead of interrupt and sell. They highlight their expertise by sharing valuable content rather than defaulting to the old sales playbook of cold-calling, hoarding information, and letting it drip out when they are good and ready. To be a high performing salesperson in today’s real-time world, you’ve got to be on the buyer’s timetable, not yours. We also have the ability to interact and participate in conversations that other people begin on social media sites, including Twitter, Facebook, LinkedIn, forums, and review sites. The key is to focus on the buyer’s needs, not your own ego. Stop hyping your products and services. Don’t rely on interruption techniques. Don’t take advantage of people’s time and attention with unwanted product pitches. Instead you need to deliver the perfect information to buyers, right at the point when they are most receptive. 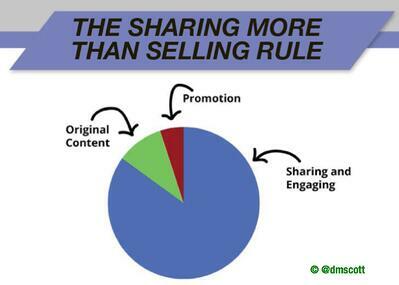 Organizations gain credibility and loyalty with buyers through sharing content. Smart marketers think and act like publishers in order to create content while smart salespeople curate that content targeted directly at their audience.